Pumpkin Butter doesn't have any butter in it, rest assured - it's sweet, dark, dense and spicy - like pumpkin pie in a jar. It's delicious on toast or pancakes and makes great holiday gifts!! I made a bunch last year and it's on my "to do" list for sometime soon again. As always, I've adapted this to a crock-pot, as it's my favorite (lazy) way of cooking just about anything. Combine all ingredients in crock-pot and stir to mix well. Cook on Low for 5 hours, stirring occasionally. It will thicken as it cooks. Do not let it burn or stick. Store in the fridge or freeze.After it's done, if you want to can it - fill the pint jars or 1/2 pint jars and seal. Process in water bath canner for 40 minutes. Oh my goodness that looks amazing. I don't think I could ever top anything with it, though, I'd be eating it straight out of the jar! Yum! 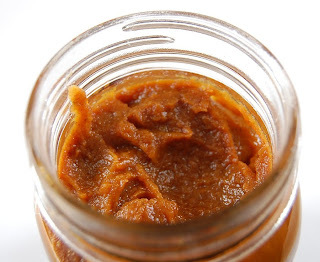 I make apple butter every year, but I have never tried pumpkin butter! I HAVE to make this. Now! My whole house smells like the best holiday memories ever, because this pumpkin butter is in the crockpot! This looks great! I have a vegetarian slow cooker blog (1 thing a day, vegetarian, made in the crock pot)and I would like to use this recipe next week and post about it. It made 3 Maman jam jars worth, if that's helpful.